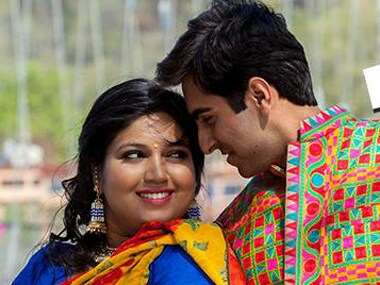 New Delhi: Director Sharat Katariya got the idea for his upcoming, '90s nostalgia-filled love story 'Dum Laga Ke Haisha', from a poster about unusual and weird sports. "I got the idea from a poster about unusual sports and one of them was wife-carrying competition. I thought it would be interesting if the husband was thin while the wife was on the heavier side. Somehow, the thought stayed with me," Sharat said. Starring Ayushmann Khurrana and newcomer Bhumi Pednekar, the YRF film, releasing tomorrow, revolves around a mismatched couple (Prem and Sandhya) who try to find love after their arranged marriage. Sharat, whose writing credits include 'Bheja Fry', 'Bheja Fry 2', 'Hum Tum Shabana', 'Sunglass' and 'Titli', made his directorial debut with '10ml Love'. The director said he decided to revisit the "bizarre idea" when things were not moving in his life. "I was pretty low when I wrote the story. I had just directed '10mm love' which did not do well and I thought I did not have it in me to direct. I decided to focus on writing which came naturally to me. When Maneesh (Sharma) read the story, he liked it and told me to direct it. He later decided to back it," he told PTI. Sharat said it was a conscious decision to set it in Haridwar and in the 1990s when Kumar Sanu's voice ruled Bollywood. up to get their pictures clicked with him like typical fans. In that sense, it is very nostalgia-inducing," he said.